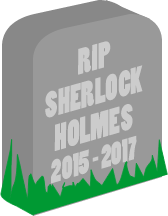 It is with very mixed emotions that I would like to tell you that Holmes Volume 1 and 2 will be soon removed from digital channels. Note the remaining stock of paperbacks will still be available in bookshops. This is due to a very exciting development that I will be announcing soon. I'm sorry if this causes any inconvenience. ... and all good or bad bookshops.